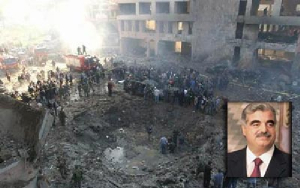 the brother in-law of assassinated Hezbollah commander Imad Mughniyah, is the prime suspect in the assassination of former Lebanese Prime Minister Rafik Hariri on February 14, 2005. Badreddine replaced Mugniyah as Hezbollah’s chief operations officer after he was killed in a mysterious explosion in Syria on Feb. 12, 2008. The 50-year old is a member of the Hezbollah Shura Council. He was arrested in Kuwait in 1990, broke out of prison and escaped to the Iranian Embassy in Kuwait, and Iran’s revolutionary guard escorted him to Lebanon. Badreddine, also known as Elias Saab, who is a little older then Mugniyah, was prior to the 1982 war with Israel in Lebanon an officer in the Palestinian Fatah elite “Force 17” in Beirut. He was the trainer of Mugniyah in “Force 17” in sabotage and bombs construction. After Fatah was expelled from Beirut, in October of 1982, they joined together the newly formed Shiite militia – the “Oppressed on Earth” supported by Iran, which became soon the base for the Hezbollah. Mugniyah was the mastermind behind the bombing of the US Marine Corps barracks in Lebanon in 1983, an action that killed 241 Marines. Salim Ayyash, 48, is accused of leading the cell which executed the assassination of Hariri. He holds a U.S. passport and is a volunteer with the Lebanon’s Civil Defense. Suspected connections of Hezbollah and the Syrian government to the killing have raised tensions in the country, stoking fears of sectarian conflict erupting in the ethnically and religiously diverse nation, which endured a civil war from 1975 to 1990. Hezbollah has had longstanding animosity toward the tribunal, based on the expectation that some of its members would be indicted as conspirators in Hariri’s assassination. Hezbollah is a political faction in Lebanon and provides social services to the Shiites, but it has long been regarded as a terrorist organization by the United States and as an ally of Iran. The movement, which fought a war on Lebanese soil against Israel five years ago, claims the tribunal is a plot involving the United States, Israel and France. Ibrahim Mousawi, a Hezbollah media relations officer, said it had no immediate reaction to the indictments. The United Nations and the Lebanese Republic negotiated an agreement on the establishment of the tribunal, based at The Hague. “Today, we witness a distinctive historic moment in the life of Lebanon’s political, judicial security, and ethical systems. And I feel in the beat of my heart, the embrace of all the hearts of the Lebanese who defended the cause of justice and refused to bargain on the blood of the martyrs,” Saad Hariri said in a statement. Rafik Hariri was 60 when he was killed, a self-made Sunni billionaire of humble origins. His son Saad, 40, leads a political bloc known as “March 14,” which includes prominent Christian leaders. The group’s adversaries include Hezbollah and other factions. Syria had thousands of troops in Lebanon and great influence in the country until mass protests after Hariri’s assassination forced their withdrawal. Six years later, the shadow cast by that day still hangs over Lebanon, which finds itself in a political crisis — in part caused by the bitter divide over the country’s special tribunal that is tasked with investigating Hariri’s assassination. Earlier this year, Hezbollah brought down Saad Hariri’s government. His replacement is Prime Minister Najib Mikati, a Sunni political independent who was backed by Hezbollah and its allies. Besides being prime minister of Lebanon for 10 years between 1992 and 2004, Rafik Hariri was the driving force behind Beirut’s renaissance as a Mediterranean jewel, investing in the restoration of a city center that not so long before had been the frontline in Lebanon’s civil war. Hariri’s murder, which prompted a strong anti-Syrian protest by the Lebanese people (dubbed the Cedar Revolution), led to Syria ending its 29 year-old armed presence in Lebanon in April 2005. Salim Ayyash, 48, is accused of leading the cell which executed the assassination of Hariri. He holds a U.S. passport A U.S. PASSPORT? Shows how little the Americans have understood the minds … although they began to scramble to learn after 9/11 – perhaps. Yet, most there read headlines of local news only. Something like average people everywhere ….